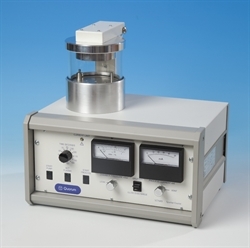 The SC7620 is a compact entry-level SEM sputter coater. When combined with the optional SC7620-CF carbon fibre evaporation attachment it makes the ideal low-cost SEM sputtering and carbon coating system package. Additionally, the SC7620 is fitted as standard with a glow discharge function, making it suitable for the hydrophilisation (or ’wetting’) of carbon-coated TEM grids and for other surface modifications. Note: for a fully automated glow discharge solution with choice of single or dual chamber formats, please see: GloQube. The SC7620 is primarily designed for coating specimens prior to examination in tungsten filament SEMs. For extra fine grain coating required for most FE-SEM applications, high vacuum coating is required - see the Q150T or Q300TT. For a fully automatic coater for W-SEM applications please see the Q150R. The SC7620 is ideal for the budget-conscious user who demands quality thin film deposition from an easy-to-use instrument. Designed for routine applications, the SC7620 uses a basic magnetron sputter head with a simple-to-replace disc target (gold/palladium as standard). The sputtering head is hinged for easy operation and fitted with electrical safety interlocks. A panel-mounted switch allows the system to be changed between sputter coating and glow discharge modes. To prevent accidental damage the high voltage lead is shielded. The plasma current is variable by adjustment of the vacuum level using an argon leak valve with the plasma voltage being preset. For maximum sputter coating efficiency the gas injector system ensures that argon gas enters the chamber close to the plasma discharge. Venting is to argon. A suitable rotary vacuum pump is required. The Pfeiffer DUO 6 5 m3/hr two-stage rotary vacuum pump is ideal for this purpose. See: Ordering Information for more details. The 100 mm/4” diameter Pyrex cylinder is mounted on an aluminium collar and sealed with O-rings. The small vacuum chamber size means pump down times and cycle times are fast and also allow a small economical rotary pump to be used. The specimen stage is height-adjustable and it can easily be removed to accommodate taller specimens. The deposition rate is controlled manually by a 180-second timer with 15-second resolution. Pressure and plasma current are monitored by analogue meters. The SC7620 will deposit coatings suitable for use with tungsten-filament SEMs and has the advantage of simple operation, ensuring reliability and suitability for general use. It can quickly be converted to deposit carbon by the addition of an optional carbon evaporation attachment, consisting of a switchable voltage power supply and a carbon fibre head (see: SC7620-CF below). The carbon attachment comes with an additional glass cylinder. This is taller than the standard sputter coater cylinder and ensures that the distance between the carbon fibre and the specimens is optimal for the evaporation process. A three-way switch on the front panel allows the SC7620 to be switched to glow discharge mode. Note: for a dedicated, fully automated glow discharge solution with choice of single or dual chamber formats, please see: GloQube.